Attention all Cape Bretoners,seemoresites.ca, the official sponsor for sight seeing is hosting a contest to choose the top five sights to see in Canada and Cape Breton's Cabot Trail is one of the options to vote for. The competition is stiff, the Cabot Trail is up against Niagara Falls,Old Quebec City, Old Montreal City,the CN Tower,The Canadian Rockies,Stanley Park, BC, the Bay of Fundy, NB, Peggy's Cove, and the Pacific Rim National Park in British Columbia. We have the opportunity to put the Cabot Trail where it belongs, among the top five sights to see in Canada. Being given the distinction of this degree would definitely bring added attention to Cape Breton Island. Cape Breton Island has drawn accolades for being the number 1 lsland in North America and number 3 island in the world to visit, it has also been given the destinction of most romantic place to visit in Canada and the Cabot Trail has already received the accolade of being named the most scenic drive by motor cycle drivers world wide, lets add this new distinction to our list. Visitors who will be planning a vacation to Canada will want to include the top sites to see. 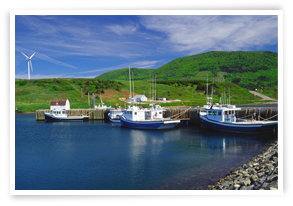 So lets do our part, go to http://www.seemoresights.ca/thegreatcanadiansightstour.aspx and vote for the Cabot Trail. Vote Now!!! Share the above mentioned link and encourage your friends and associates to get in on the vote.